They beat and tortured my husband Chen Guangcheng and me for more than 2 hours . . . 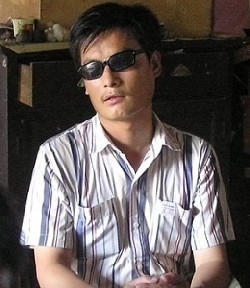 I saw more than ten men surrounded Chen Guangcheng, torturing him. Some of them twisted his arms forcefully while the others were pushing his head down and lifting his collar up tightly. Yuan's letter also states that the police sealed their windows with sheets of metal, seized their computer, confiscated their books, stole Chen's blind cane, and grabbed toys belonging to their young daughter. Further, Chen has been denied medical treatment and his health is in jeopardy. Yuan's letter ends with a plea for legal action to protect her family. Why is the Chinese Communist Party determined to crush Chen? The CCP wants the world to think that its One Child Policy is voluntary. Chen, however, exposed the systematic use of forced abortion and involuntary sterilization in implementing this policy. Time Magazine named him in its list of "2006's Top 100 People Who Shape Our World." The Chinese Communist Party, however, handed him a four year jail sentence. His family has been languishing under house arrest since his release in October, 2010. Chen Guangcheng is the "Tank Man" against China's One Child Policy. Impoverished, beaten and blind, Chen nevertheless possesses the surpassing backbone to stand alone against the grinding juggernaut of this totalitarian regime. The CCP apparently perceives in Chen a real threat to its crumbling legitimacy. In pressing for justice for Chen and his family, let us not forget those for whom he has sacrificed his freedom: the families of China who are being shattered daily by forced abortion, forced sterilization and infanticide. The coercive enforcement of China’s One Child Policy causes more violence against women and girls than any other official policy on earth. It is the greatest women's rights issue in the world today. No one supports forced abortion, because it is not a choice. Women's Rights Without Frontiers condemns the house arrest of Chen and his family. We demand their immediate release and medical attention.